The setup is in english language,however during the installation the setup sets the Project Reader language to Italian or French or German or Spanish or Portuguese if the operating system is in Italian or French or German or Spanish or Portuguese language, elsewhere sets the Project Reader language to English. 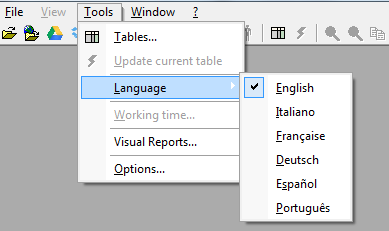 In any case when the setup is finished you can choose your preferred language from menu' Tools-->Language. To uninstall Project Reader open the Windows Control Panel, choose Uninstall a program, from the list select Project Reader and click on Uninstall.